The wholesale US gasoline market is in the midst of its seasonal transition from winter-grade gasoline to the more costly to produce summer-grade product, and demand is expected to increase as the warmer weather encourages driving. This is the time of year when gasoline futures advance toward their annual high, and futures are climbing, yet based on historical data are demonstrating less oomph then might be expected. Called reformulated blendstock for oxygenate blending, the gasoline futures contract traded on the New York Mercantile Exchange ended March with seven consecutive sessions with an advance, with the nearest delivered futures contract rallying 9.5cts or 6% during the week-ended March 31. Still, the now expired April contract remained below the $1.7257 gallon 18-month high on the spot continuous chart registered March 1, as concern over subdued gasoline demand capped the upside and pressed the contract to a $1.5623 gallon March low. 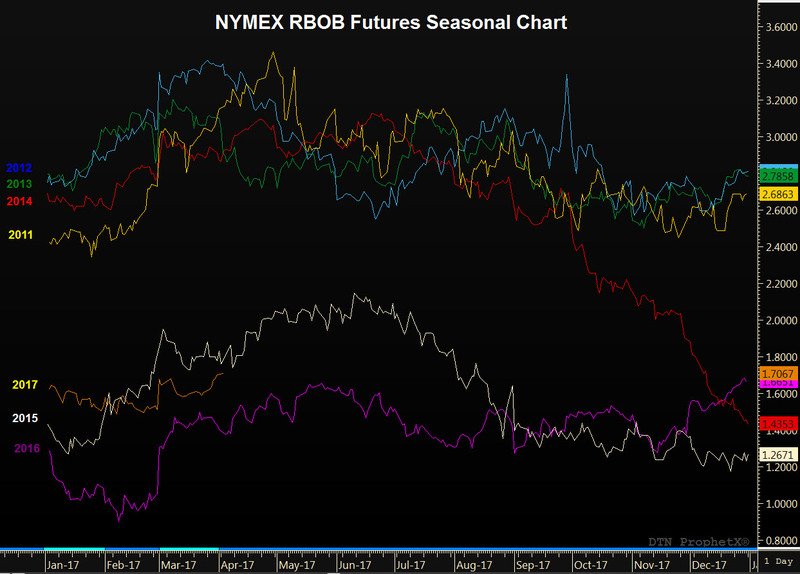 The seasonal chart shows NYMEX RBOB futures trading at a premium to 2016’s price performance, while trailing 2015’s values. In 2016, RBOB futures traded at an annual intraday high on May 24 at $1.6664 gallon, and in 2015 at $2.1858 gallon on June 17. The gasoline futures contract is holding well below the 2011-2014 seasonal price patterns, with oil futures selling off hard during the second half of 2014 as a supply glut swamped the market. Now in its third year, a globally oversupplied market continues to limit price gains, although there are signs that the global oil market is drawing down inventory after three months of production cuts by the Organization of the Petroleum Exporting Countries. OPEC and 11 non-OPEC oil producing countries agreed to cut their crude production by nearly 1.8 million bpd during the first six months of 2017, and OPEC compliance with their agreement has been strong at over 90%. Yet, US crude production has soared with higher global crude prices, which are again over $50 bbl. Since the start of 2017, US crude production is up 377,000 bpd to a nearly 14-month high of 9.147 million bpd, and is expected to continue to grow, mitigating the OPEC-led production cuts and capping the upside in fuel prices. Gasoline futures did shift into a bullish backwardated market structure as May RBOB futures rolled into the nearest delivery position with the expiration of the April contract on March 31. A market is in backwardation when supply nearest to delivery trades at a premium to deferred delivery, with the price premium in a nearest to delivery contract occurring despite the storage and hedging costs associated with deferred delivery contracts. Although in a bullish market structure, too much gasoline supply has weighed on the front end of the forward curve since 2016, limiting price gains in the wholesale and retail markets. In the primary wholesale market, physical supply is traded in bulk transactions as they move from the refinery gate to distribution terminals, with those trades indexed against the nearest or second nearest delivered futures contract. Gasoline supply was drawn down in the fourth quarter and rebuilding early in the first quarter in agreement with the market’s seasonal tendency. On February 10, US gasoline supply reached a record high of 259.063 million bbl, according to data from the Energy Information Administration, with EIA weekly data dating back to 1990. Gasoline supply has been drawn down consistently since reaching the record high, down nearly 20.0 million bbl or 7.5% through March 24 to 239.7 million bbl, slipping 1.2% below the comparable week in 2016. Seasonal refinery maintenance should continue the draw down through April, but will the decline in inventory be enough to buoy the flaccid preseason rally? The answer will fall to demand, which so far in 2017 trailed year ago by a sizeable 380,000 bpd or 4.2% cumulatively through March 24 at 8.745 million bpd, according to data from the EIA. In 2016, implied gasoline demand averaged a record 9.35 million bpd. To learn more about Schneider Electric’s Oil & Gas offerings for the downstream market, click here. 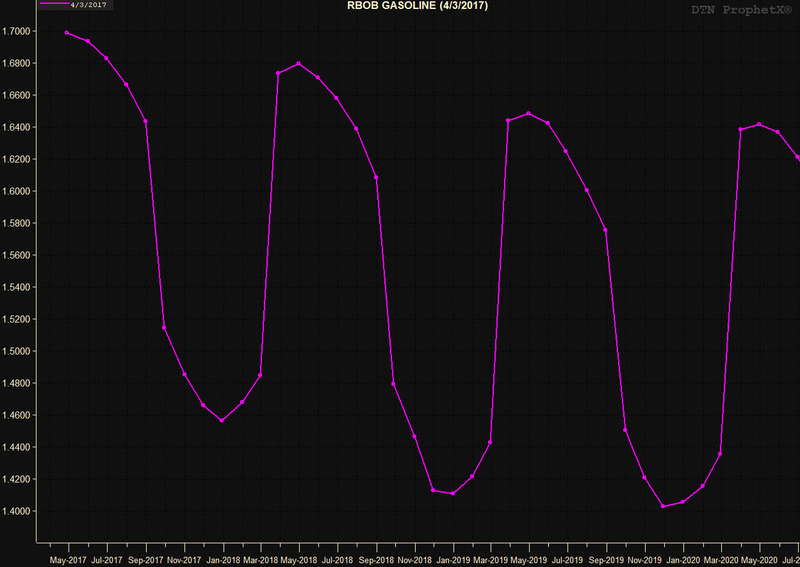 Gasoline futures to hit seasonal high in May Have Gasoline Futures Reached a Bottom? 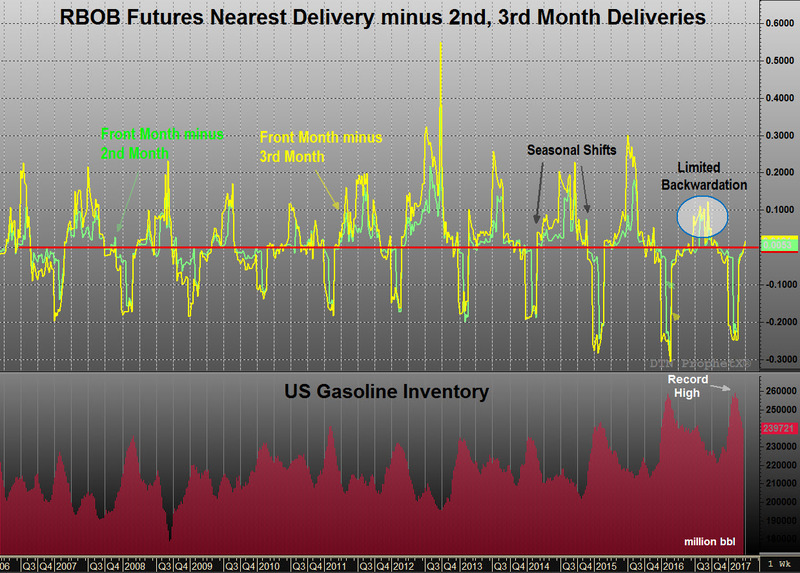 US Gasoline Futures Driving towards 2015 Low Is RBOB near its Pre-Season Rally High?